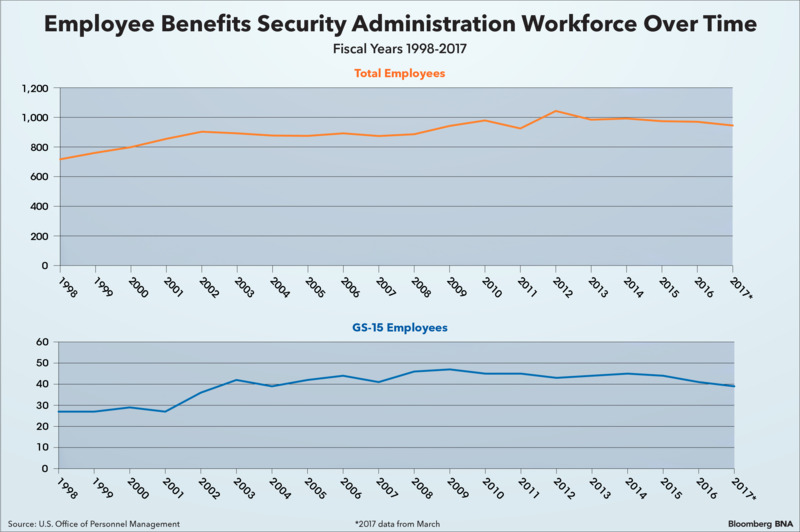 The Trump Administration’s delay in filling key Labor Department and Employee Benefits Security Administration posts corresponds with lower staffing levels and a new enforcement caseload that’s lighter than the Obama Administration’s—but not out of step with other predecessors. President Trump’s EBSA is off to a slower start than President Obama’s on at least two metrics: new cases filed and confirmation of key players. And while the agency’s workforce is about the same size as it was in the early days of the Obama administration, total staffing numbers have declined more than 9 percent since their Obama-era peak in September 2012. Even so, the Trump-led EBSA isn’t wildly out of line with those of other recent administrations. The agency employs more people than it did during any recorded point in the George W. Bush Administration, and it’s filed more new Employee Retirement Income Security Act lawsuits than it did during President Bill Clinton’s first months in office. When contacted for comment on this article, a Labor Department spokesman told Bloomberg BNA that EBSA remains committed to fulfilling its mission. The Trump-era Labor Department has filed 36 ERISA lawsuits in its first eight months, compared with 59 cases filed during the first eight months of the Obama years. Although that represents a 39 percent drop from the previous administration, it’s within the range of cases filed by the Bush and Clinton administrations in their first eight months: 41 and 23, respectively. 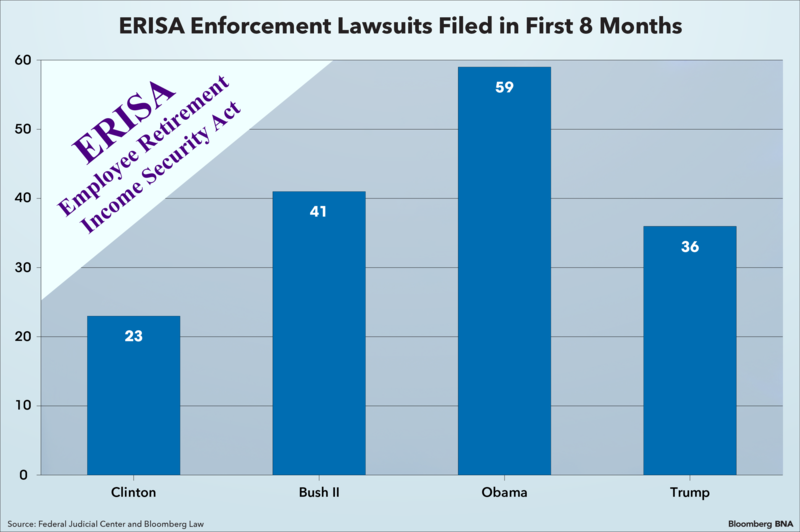 Because of the lengthy investigation that typically precedes the filing of a given ERISA lawsuit, variations in case filing rates among presidential administrations might not be a good indicator of differences in the administrations, Marc Machiz, former director of EBSA’s regional office in Philadelphia, told Bloomberg BNA. “There’s a very long runway for a case to go from opening an investigation to filing a lawsuit—oftentimes we’re talking about years,” Machiz said. According to Machiz, changes in budget and staffing levels can better shed light on how the agency’s enforcement of ERISA varies among administrations. Indeed, EBSA staffing levels are down in the early days of the Trump Administration. The agency employed 945 workers in March 2017, which is the agency’s smallest workforce in five years. It’s also a 9 percent decrease from the 1,043-person EBSA workforce of September 2012. What’s more, the number of EBSA workers categorized as GS-15—the highest civilian pay grade in the federal government—is lower than its been anytime since 2004, when the agency’s total workforce was 7 percent smaller. EBSA employed 39 GS-15 workers in March 2017, down from 47 in June 2012. And while Congress hasn’t yet approved a Labor Department budget for 2018, the House of Representatives is currently debating a measure ( H.R. 3358) that would reduce EBSA’s budget to $175.6 million from $181 million, where it’s held steady since 2015. The DOL had requested nearly $184 million in EBSA funding for 2018. These agency changes come as the Trump Administration continues to experience significant delay in appointing and confirming key DOL players. 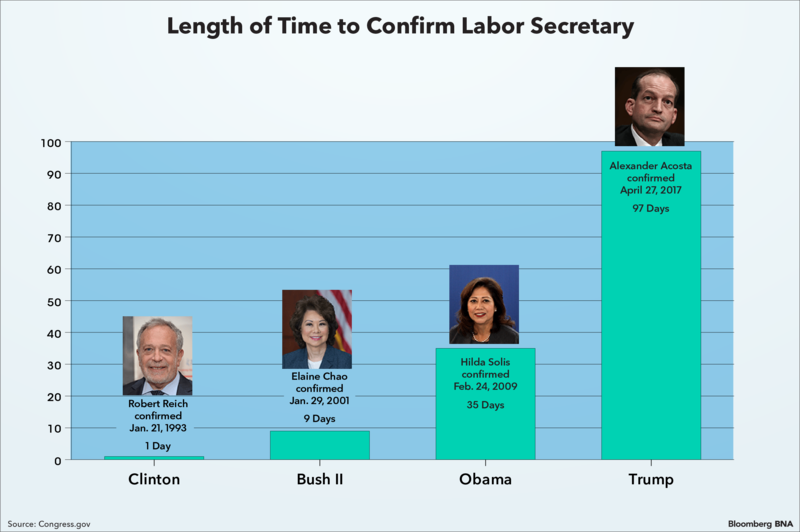 Trump’s Labor Secretary, Alexander Acosta, was confirmed on April 27, 2017—97 days after Trump took office. This delay—which is partly explained by the failed nomination of Trump’s first pick, Andrew Puzder—is much longer than those experienced by the Clinton and Bush administrations, both of which saw their secretaries confirmed within two weeks of taking office (Clinton Labor Secretary Robert Reich was confirmed one day after Clinton’s inauguration). The Senate confirmed Hilda Solis, Barack Obama’s first Labor Secretary, 35 days into his presidency. And finally, the Trump Administration is far behind its predecessors in confirming an EBSA head, which is the government official charged with enforcing ERISA. 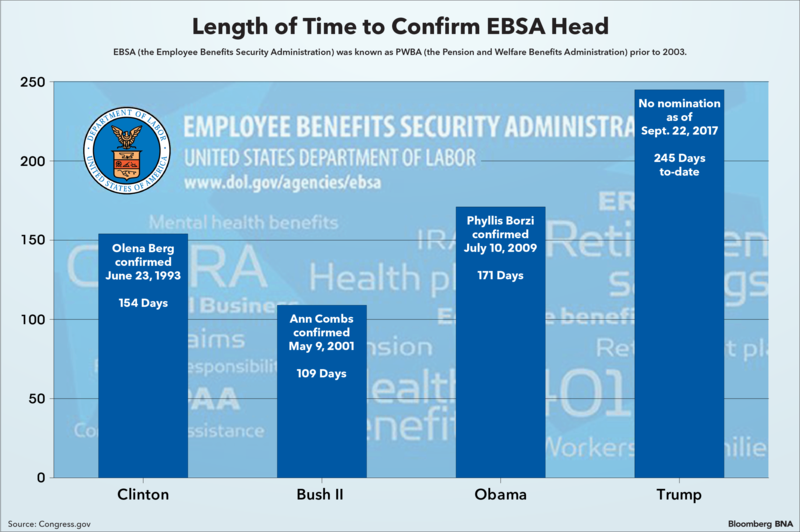 The Clinton, Bush, and Obama administrations saw their EBSA heads confirmed in an average of 145 days, with Obama pick Phyllis Borzi taking the longest (171 days). Nearly 250 days into his presidency, Trump has yet to nominate an EBSA head for Senate approval.